NEW YORK CITY – Pace University Press presents the twentieth volume of the Journal of the Early Book Society, a fascinating collection on the history and formation of manuscripts and early printed books, highlighting the transition from manuscript to print. Volume 20 focuses on aesthetics, libraries, gender, voice, lyrical texts, form, and function. Articles include: “At Work in the Anchorhold and Beyond: A Codicological Study of London, British Library, Cotton MS Nero A.xiv” by Megan J. Hall; “‘All the Strete My Voyce Shall Heare’: Gender, Voice, and Desire in the Lyrics of Bodleian MS Ashmole 176” by Carissa M. Harris; and “‘Ce petit amas de rymes’: Musicality in Jeanne de Marnef’s Edition of Pernette du Guillet’s Poetry” by Jessie Labadie. There are additional original articles, such as “Balancing Form, Function and Aesthetic: A Study of Ruling Patterns for Zodiac Men in Astro-Medical Manuscripts of Late Medieval England” by Sian Witherden and “Did the Scribe Draw the Miniatures in the British Library, MS Cotton Nero A.x (The Pearl-Gawain Manuscript)?” by Maidie Hilmo. Also featured are descriptive reviews and notes on libraries, collections, manuscripts, and early printed books. 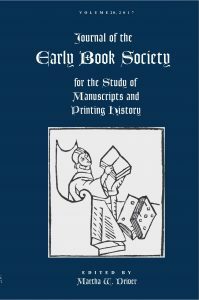 Journal of the Early Book Society for the Study of Manuscripts and Printing History (ed. Martha Driver) was founded in 1987 for all those interested in the study of medieval and Renaissance manuscripts and early printing history. Since its founding, the Early Book Society has sponsored sessions at the International Congress of Medieval Studies, Western Michigan University, and has run an international conference. To receive information on distributing Journal of the Early Book Society to your membership, please contact Erica Magrin or visit our website: www.pace.edu/press and join us on LinkedIn. Single copies are available for $40. Organization discounts are available upon inquiry. 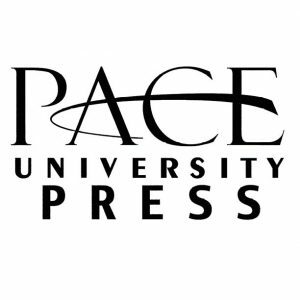 Founded in 1987, Pace University Press is a small, dynamic academic press with wide-ranging interests. From the prestigious Woolf Studies Annual to the more recent Journal of Comics and Culture and Journal of Beat Studies, the Press currently publishes seven journals a year. Our publications make peer-reviewed research both available and accessible.